Discussion in 'News' started by Kenzie, Aug 5, 2016. X-MG is still in development so you won’t see him in this week’s update. Instead we focused on some more performance optimizations like turning tracers & hit impacts off by default and making rooms have a max of 12 players. The Ultimate Ability charge counter will now continue to count when you die. Lastly for a visual change we added movement to the leaves & bushes (brings the world to life a bit). polandmatt and MiguelDreamer like this. One strange thing we are noticing, this is happening often, everyone joins the same team! MiguelDreamer and Kenzie like this. Maybe some players don't like to play alone or in disadvantage, so if there aren't limits they will join in the majority team like the others. If the server is 12 players, the max. players of each team should be 6, and you could put a limit to changing team, as said in Trello Backlog. 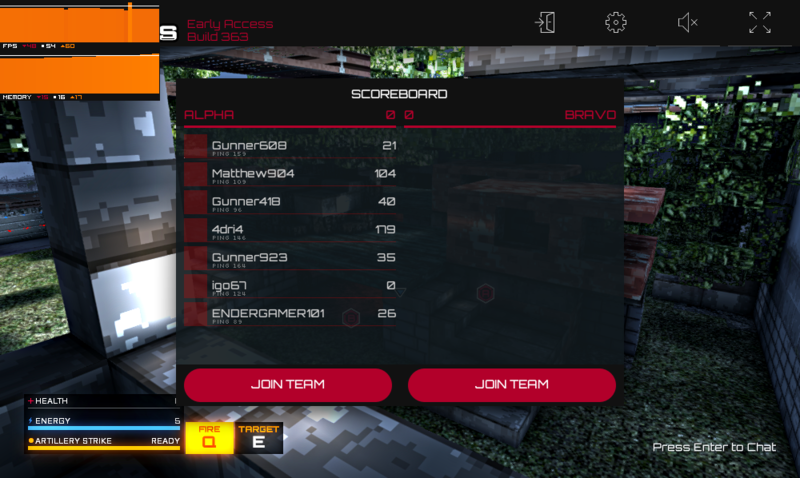 Part of this update does limit each team to 6 players. We thought about auto-joining people onto a team, but have a bug there so couldn't get it to work in time. I think the biggest issue right now is still performance. The game is CPU limited, things like player animation are taking as long as rendering! WebGL is even more limited than I originally thought. The performance issues really become apparent when a server has 12 people in it. That is a fun amount of people, but the framerate gets pretty bad sometimes. So priority for next week is back to more performance improvements. ah, can't wait for next week!